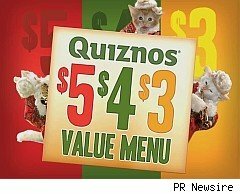 The $2.99 Quiznos coupon for a small sub, regular fountain drink, and bag of chips is back. The coupon is good through Aug. 30, 2010 so make sure to print out a few if you are a fan of Quiznos. One coupon per person per order. Caveats: the meal is $3.99 in Alaska and Hawaii. Not valid on delivery orders. You must have an original coupon to get the deal. May not be combined with any other offer, including combo discount. You pay taxes.